I've loved this wallpaper ever since I saw it back in 2007 via the Princess Margaret Lottery Showhome. It's called Magnolia... so pretty! Here's one I'm loving and considering as the wallpaper artwork for my livingroom. Called Istanbul. You can see it featured via H&H Online TV, click here to launch it. reminds me of this picture... the scale of the artwork is perfect for above the sofa and shows the pattern repeat which I love. This print is called Woods and I remember seeing back in season 1 of HomeHeist but since, it continues to pop up in room designs. Not sure why it's so popular?... hmmm. Check out more of Cole & Son wallpapers here. 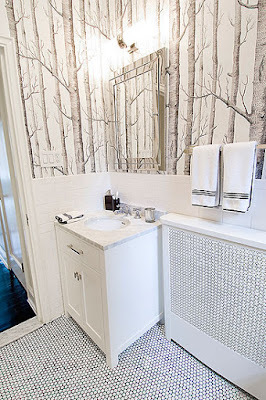 I really like the look of the Woods in the bathroom, very cool - but dont so much like the dark version in the first picture. Great blog! I love your wall paper gallery !! 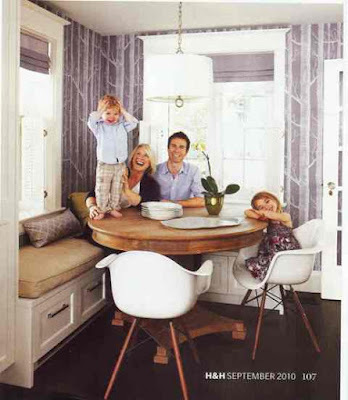 I love that wallpaper featured in that H&H Online TV episode! Didn't you love that condo of theirs?? And I am actually a big fan of their Woods print - I always pictured it in an entry way! Does anyone know where to purchase wood wallpaper in canada?